Have you come across a gun or a closet full of guns in the Stuff you’ve inherited? Before handling them, ask someone with some experience to check them all to make sure none are loaded. This is a tricky topic since laws differ from state to state, so it is hard to make generalized statements. Goodwill outlets will not resell guns or ammunition, but they often work with their local police to find a safe way to dispose of them, so they might take yours as part of a larger donation of Stuff. Some stores like the Gander Mountain chain will buy used guns. Gun shows are another option for firearms old and new. These can be helpful because you can approach several dealers and compare their offers. Old guns are called antiques if they are very old and relics if they date from the first half of the twentieth century. 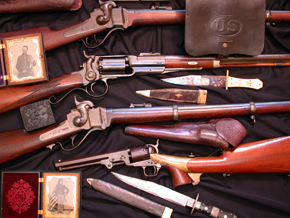 Old guns are often sold by specialized dealers to collectors. If you aren’t knowledgeable about firearms, you might want to avoid gun dealers, many of whom take advantage of rookies. An auction is more likely to result in the best price, because most of these draw from a worldwide group of collectors. Consider contacting an auction house for old firearms and accessories. Two possibilities: www.jamesdjulia.com or www.rockislandauction.com. Take a picture of each gun and send it along with your e-mail. If they aren’t interested, they can usually steer you to another auction house that is more appropriate. Get several responses before deciding which house to do business with. Or maybe you want to take the guns home and do some research before selling. Your public library will have many books that will help you identify what you have and there are online resources for that too, although these can be difficult to work with if you have no knowledge about firearms. If you are dealing with an estate in a state other than your own, you may have difficulty transporting guns home. Before heading home with guns in the car or packed in checked luggage, call the local police or go online and check the gun laws in your state and the state where your relative was living. One source is http://en.wikipedia.org/wiki/Gun_laws_in_the_United_States_(by_state). Glass has been around since the ancient Egyptians. Leaded glass (also called crystal) was invented around the end of the 1600. In leaded glass, the calcium is replaced with lead, which results in a more brilliant, sparkling product with fewer air bubbles or imperfections. It makes the piece heavier than plain glass. 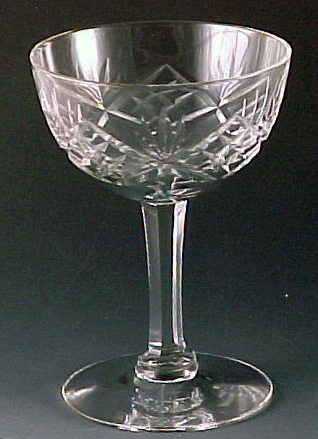 English and Irish crystal has long been popular in America, alongside American producers like Lenox. Brides are as interested in fine crystal as they are in porcelain dishes and sterling silver tea services . . . which is to say, not much. There is more of this Stuff on the market than there are people who want to buy it, but yours may sell if it is particularly appealing. Check with www.replacements.com to see what they will pay you for your stemware and bowls, then look at the Usual Suspects (www.eBay.com, www.worthpoint.com, www.liveauctioneers.com) on the chance that something similar to yours has sold recently. The lead oxide also makes the glass easier to work at lower temperatures, which allows artists to cut fancy decorations into the glass. This is called cut glass. A cut-glass bowl has sharp edges and is worth more than a similar pressed-glass piece made in a mold. You can probably tell the difference with your fingers. A very sharp edge means cut glass; a smoother edge is pressed. Cut-glass items include punch bowls and cups, compotes, small dishes, bowls, chandeliers, and even lamps. Pressed glass, a cheaper imitation of cut glass, has minimal value. You can usually see (and feel) the mold lines or seams on these pieces. As with ceramics, any damage eliminates almost all an object’s value, although special antiques with minor damage may still have some sales appeal. Some cut glass items sell on eBay; others languish. A good website is www.cutglass.org. Got Hats? Such a Dilemma . . .
Hardly anyone wears hats today, so any hats you’ve inherited will probably be quite old. Nonetheless, their value is modest. Consider donating them to a theater program at your local college, high school, or community theater where the actors would rejoice to receive a few fedoras or pillbox hats. If you prefer to sell and your hats are particularly fetching, take them to a vintage clothing store and ask what they are and what they would pay you for them. If that doesn’t please you, research at the library (Vintage Hats and Bonnets 1770-1970 by Langley is one good reference) or search online for “vintage hats.” Once you know what you have and how old they are, sell them yourself online. An interesting old hat can sell for a few dollars, but the competition is steep. Many, many vintage hats are listed on eBay and less than a third actually find a buyer. A hat in its original hatbox will fetch a higher price.